The autumn forest is whimsical and beautiful. How many bright colors there are in it! But among the trees, dressed in yellow outfits, rowan is especially prominent. The heavy clusters of scarlet berries burn in the sun, attracting the attention of people and birds. Sweet aroma fills the air. Birds willingly cherish ripe fruits, and people admire its magical beauty. Known as sorbus, whitebeam, rowan, service tree, and mountain-ash, it is a tree-amulet used in magic and folk medicine. 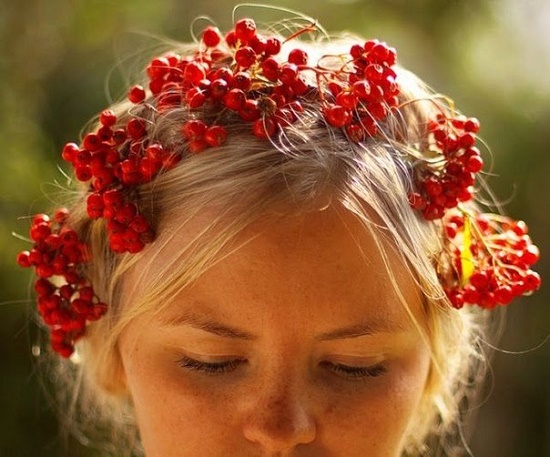 Considered a magical plant for many centuries, it played an important role in the beliefs and rituals of the ancient Slavs, Scandinavians and Celts. For example, in some places the peasants, when they returned from the cemetery, hung rowan rods over the door, so that the deceased “did not return home.” And in case the deceased turned into a ghoul after death, he was nailed to the ground by a stake, which was sometimes made from rowan. Wanderers made a staff out of mountain ash, chewed it and left a chip in their mouths behind their cheeks so as not to be afraid of any sorcery on the way. 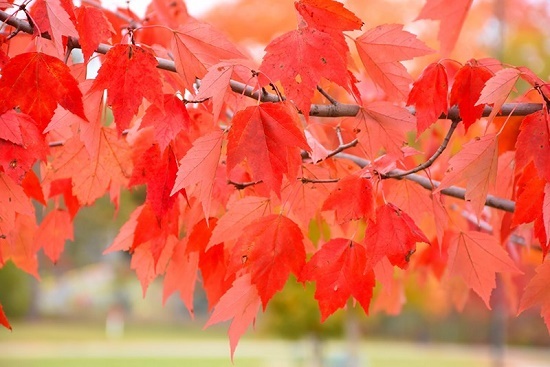 The beautiful red maple leaf has been the national symbol of Canada for over 150 years. Red and white are the official colors of Canada, proclaimed by King George V in 1921. According to historians, maple leaf began to serve as a Canadian symbol as early as 1700. Long before the arrival of European settlers, Aboriginal peoples had already discovered the food properties of maple sap – which they gathered every spring. Since the 1800s, Canadians have paid tribute to the maple leaf many times. According to Psychologists, Maple is a tree that helps to find peace of mind for people of all types, brings comfort, and self-confidence. It is a tree of inner strength and steadiness. Therefore, maple creates barriers to Darkness. A solar disk carved from maple and hung over the door, maple steps at the entrance to the house, the doorframes of the entrance door from this tree are all defenses against evil forces. Traditionally, people used Maple to build bridges over running water. Running water is an obstacle to dark forces, and maple did not allow these forces to use the bridge. Also, maple branches, covering the barn, or stuck in the walls, protect cattle from evil eye and spoilage. By the way, a drink from fermented maple juice is a sacred wine of sun worshipers. “And that’s how Christmas toys would look …” – with this phrase Stanislav Shinkarenko began a series of publications before the Christmas holidays in 2013. A talented naturalist and a great photographer, Stanislav Shinkarenko named his album “Chitinous Jewels”. Indeed, in the animal world, there are creatures that resemble a Christmas tree decoration. 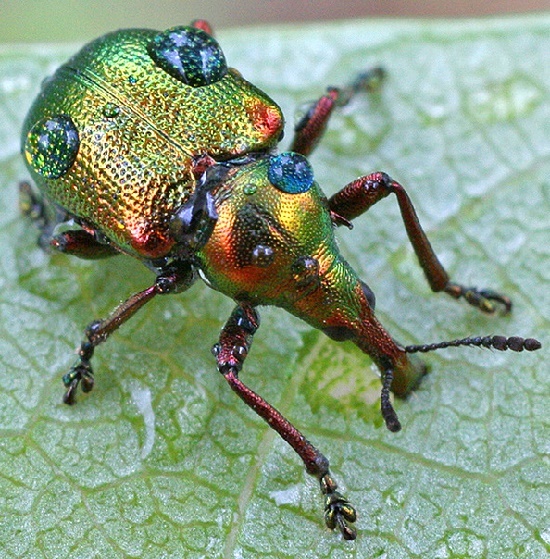 In particular, these beetles shimmering with all the colors of the rainbow … In fact, golden-colored spectacular beetles live in the Lower Volga region. Real gems, shimmering with a variety of colors – from gold to violet, from bronze to bright green. However, this golden insect, common in all wine growing areas, once caused great damage to the grapes. And accordingly, Byctiscus betulae was subject to destruction with the use of insecticides. 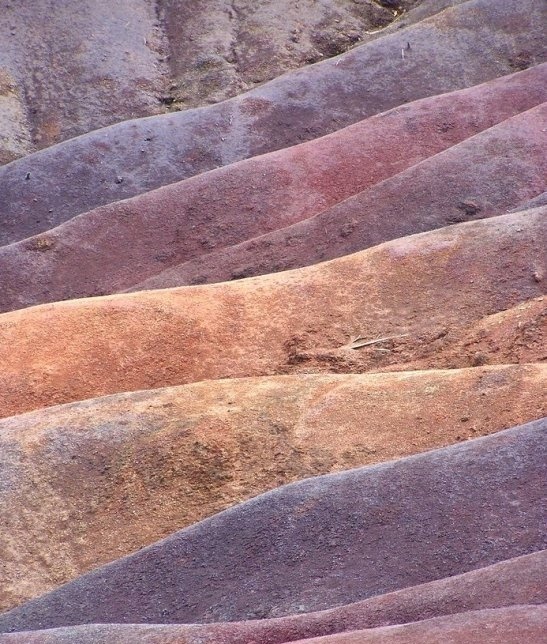 French Terres des Sept Couleurs, known as Seven-colored sand, is a formation and a famous tourist attraction located in the south-west of Mauritius, near the village of Chamarel. Occupied by sand dunes, this small area consists of sand of seven different colors (red, brown, purple, green, blue, purple and yellow). Noteworthy, the sands of these colors randomly located in different layers, and dunes, painted in different colors, seem surreal. Meanwhile, this phenomenon is also on a small scale. For instance, if you mix two handfuls of different shades, eventually they will still be divided according to the color spectrum. Also noteworthy that the dunes are not subject to erosion despite the torrential tropical rains of Mauritius. The sands formed from basalt (effusive rock) into clay, which then turned into ferralite soil due to complete hydrolysis. Aluminum and iron, the two main components, give the blue-purplish and red-black color, respectively. According to researchers, the difference in shades is a consequence of the cooling of molten volcanic rocks at different external temperatures. However, it is still not clear why they did not mix. Green is a truly symbolic color in Celtic folklore, and in particular, in British forlklore. Together with red, green was the color most favored by the fairy races who inhabit the ancient Celtic lands. Many humans, especially in Scotland, traditionally refused to wear this color so as not to offend their fairy neighbors. Indeed, some Scottish families considered it fatal to use this color. Meanwhile, common associations between the green color and flourishing vegetation point to the fairies’ earlier incarnation as spirits of fertility and abundance. People who prefer brown color want physical rest, peace. Indeed, a cup of hot aromatic coffee or cocoa – what could be better, especially with brown sugar… Also, people who attach great importance to their own health, and those who value stability, tradition, family, prefer this color. However, a person who rejects everything brown, is in search of his individuality. 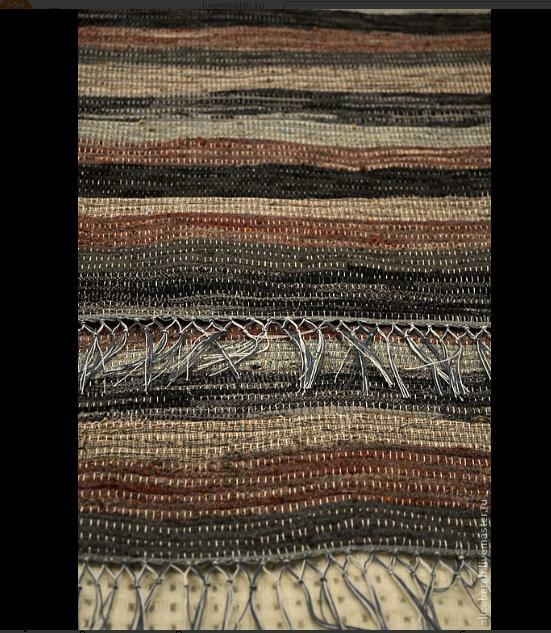 Found in nature very often, brown color is the earth itself and tree, fallen leaves under your feet, and a magnificent natural carpet of brown color. A symbol of reincarnation, Rainbow Frog is an object of worship in India. In addition, Frog, constantly changing color, is even equal to a god in India. So, hundreds of people flock every day to Reggie Kumar’s home in India, to pray and ask for miracles. And the frog glowed white when people saw it the first time. Then it lit up yellow and then turned gray. It was like a miracle, that’s why Frog, constantly changing color, considered a god in India. 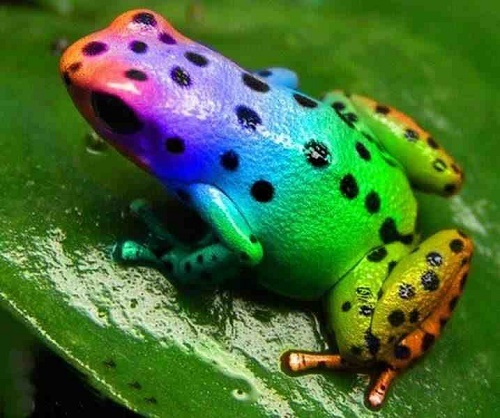 By the way, the frog has many names, and in particular, Hopper elegant, Earthy rainbow frog, and red rain frog. However, the most accurate name for this wonderful creature is – Scaphiophryne gottlebei. It inhabits the South and Central parts of Madagascar. And of course, it is very popular among terrarium fans.